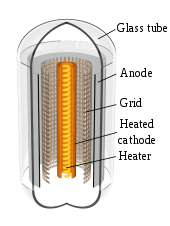 A cathode is the electrode from which a conventional current leaves a polarized electrical device. This definition can be recalled by using the mnemonic CCD for Cathode Current Departs. A conventional current describes the direction in which positive charges move. Electrons have a negative electrical charge, so the movement of electrons is opposite to that of the conventional current flow. Consequently, the mnemonic cathode current departs also means that electrons flow into the device's cathode from the external circuit. The electrode through which conventional current flows the other way, into the device, is termed an anode. Conventional current flow is from cathode to anode outside of the cell or device (with electrons moving in the opposite direction), regardless of the cell or device type and operating mode. ^  Archived 4 June 2011 at the Wayback Machine, Daniell cell can be reversed to, technically, produce an electrolytic cell. ^ a b c d e f g h Avadhanulu, M.N. ; P.G. Kshirsagar (1992). A Textbook Of Engineering Physics For B.E., B.Sc. S. Chand. pp. 345–348. ISBN 978-8121908177. Archived from the original on 2 January 2014. ^ "Field emission". Encyclopædia Britannica online. Encyclopædia Britannica, Inc. 2014. Archived from the original on 2 December 2013. Retrieved 15 March 2014. ^ a b Poole, Charles P. Jr. (2004). Encyclopedic Dictionary of Condensed Matter Physics, Vol. 1. Academic Press. p. 468. ISBN 978-0080545233. Archived from the original on 24 December 2017. ^ Flesch, Peter G. (2007). Light and Light Sources: High-Intensity Discharge Lamps. Springer. pp. 102–103. ISBN 978-3540326854. Archived from the original on 24 December 2017. ^ a b c Ferris, Clifford "Electron tube fundamentals" in Whitaker, Jerry C. (2013). The Electronics Handbook, 2nd Ed. CRC Press. pp. 354–356. ISBN 978-1420036664. Archived from the original on 2 January 2014. ^ Poole, Ian (2012). "Vacuum tube electrodes". 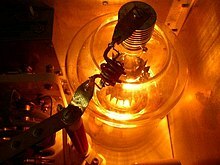 Vacuum Tube Theory Basics Tutorial. Radio-Electronics.com, Adrio Communications. Archived from the original on 4 November 2013. Retrieved 3 October 2013. ^ Jones, Martin Hartley (1995). A Practical Introduction to Electronic Circuits. UK: Cambridge Univ. Press. p. 49. ISBN 978-0521478793. Archived from the original on 2 January 2014. ^ Sisodia, M. L. (2006). Microwave Active Devices Vacuum and Solid State. New Age International. p. 2.5. ISBN 978-8122414479. Archived from the original on 2 January 2014.